Does the grass always seem to be greener on the other side of the fence? You might be making some common mistakes that are hurting the overall quality and health of your lawn. Follow these easy tips in addition to using natural nutrients and water saving fertilizer, and your lawn can be the greenest one on the block in no time. “It’s a common misconception that your lawn needs daily watering,” says Missy Henriksen, vice president of public affairs for the National Association of Landscape Professionals . A deep soak rather than a surface-level one will help avoid instant evaporation that can occur during hot days, and decreases the chances of shallow root growth. “Following this practice means that you’ll save water in the long run, and your grass will strengthen with each deep soak,” she says. Thanks to modern technology, mowers are now powered by battery, fuel and electricity, and can be more customized to suit your grass. “Before buying, consider your yard’s size and terrain, and think about the machine’s power and how much physical effort you are willing to devote to mowing,” Henriksen says. In the spring, a landscaper's fancy lightly turns to thoughts of grass and the planting to come. Here are some suggestions on choosing the best seeds to turn your springtime landscaping services into the gentle, green slopes of a summer lawn. A few questions drive grass seed choice. Is the planting climate hot or cool? Is water readily available by rain or irrigation? Is the area sunny or shaded? Answers to these question help determine the best seeds for a particular location. Grasses are either cool-season grasses or warm-season grasses. Cool-season grasses prefer cooler weather and may stay green under cover of snow during the winter. However, they are likely to wither under summer heat. If cooler weather prevails in your region, then cool-season grasses will perform best, particularly during fall and spring. Cool-season grasses include Kentucky Bluegrass, Ryegrass, and Fescues. Warm-season grasses grow vigorously during hot spells, but turn dormant and brown in cooler weather. If the temperature generally soars in your region, you’ll find warm-season grasses are the better choice. Warm-season grasses include Bermuda, St. Augustine, Bahia, Centipedegrass, and Zoysia. Water availability is also important. You may be planting in a naturally arid region or in an area subject to water conservation measures. If so, you’ll want to choose a drought-resistant variety. Drought-resistant grasses include Bermuda, Zoysia, St. Augustine, Buffalo, Bahia, and Fescue. Careful with water, though. natural nutrients and water saving fertilizer, and your lawn the greenest one on the block in no time.
. A deep soak rather than a surface-level one will help avoid instant evaporation that can occur during hot days, and decreases the chances of shallow root growth. “Following this practice means that you’ll save water in the long run, and your grass will strengthen with each deep soak,” she says. If you can’t spring for a new mower, give your current model a little TLC by balancing and sharpening blades, changing spark plugs and air filters, and draining old fuel. “Equipment and parts that are past their prime create extra work and can damage the lawn,” she says. “Many DIY mowers try and save time by taking a little extra off the top on weekly mows, hoping to avoid next week’s cut. Sadly, this shortcut doesn’t help, and in fact, it can be detrimental to the health of your lawn,” cautions Henriksen. Keep in mind the one-third rule: Grass plants attempt to balance their above and below ground growth, so the root systems are roughly equal to the mass of grass blades. Remove no more than one-third of the grass blade at any one time to help keep this balance. Plants require many nutrients, including three primary nutrients: nitrogen, phosphorus, and potassium. Nitrogen is needed for leaf growth, phosphorus for root growth and seed formation, and potassium to maintain overall vitality and contribute to the movement of sugar and starch. All of these nutrients come to the plant through the soil. When soils do not have sufficient nutrients available, deficiencies can be seen in plants by their stunted growth, discoloration of leaves, or weak flower production. Under these conditions, otherwise healthy plants like flowers, shrubs, vegetable bushes, trees and grass, become vulnerable to disease and insect damage. Nitrogen is regularly depleted in the soil and needs to be added periodically for optimum plant growth. Other nutrients such as phosphorus and potassium may also be deficient. The only way to ascertain if your soil has the proper levels of available nutrients is to have a soil test performed. What is a Soil Test? In the same way that a doctor will order a series of tests when you are sick to determine what is wrong with you, a soil test looks to see what might be wrong with your soil. Your lawn care company can perform soil testing and interpret the analysis for you. Many local extension offices provide guidance in this area as well. The individual conducting a soil test will collect small samples of soil from various parts of your lawn or garden. The samples are then sent to a laboratory for analysis, with results being provided in a report. Foremost on the report is determination of the soil pH, a measure of how acidic or alkaline the soil is. Generally, soils in the northeastern United States tend to be acidic and trend increasingly alkaline as you move south and west. Nutrients have different availability to the plants at different pH levels so the goal is to determine the pH level and to amend the soil to bring the pH into the desired range. For example, if the soil is acidic, limestone will be applied. Should the soil be alkaline, an acidifying fertilizer or sulfur is applied. The soil test results will provide the recommended amounts of limestone, sulfur and fertilizers necessary to provide optimum growth. A soil test gives clues to specific problems and provides a basis for a fertilization program. Because lawns have a long growing period, they require multiple, small applications of fertilizer spaced at pre-planned intervals. The object is to have nutrients available in sufficient quantities to satisfy plant growth requirements. Composting. The breaking down of grass clippings, leaves, twigs, small branches and fruit and vegetable peelings into humus orcompostcan add valuable nutrients to flower beds. Grass clippings.When allowed to decay naturally on a lawn, grass clippings release valuable nutrients, including nitrogen, phosphorus, potassium, and calcium. Up to one third of the applied fertilizer can be effectively recycled back into the soil simply by returning clippings. Decomposed clippings also add organic matter to the soil. Organic mulch.A layer ofmulchingmaterial in a garden bed will help improve the health and nutrition of both the soil and plants. 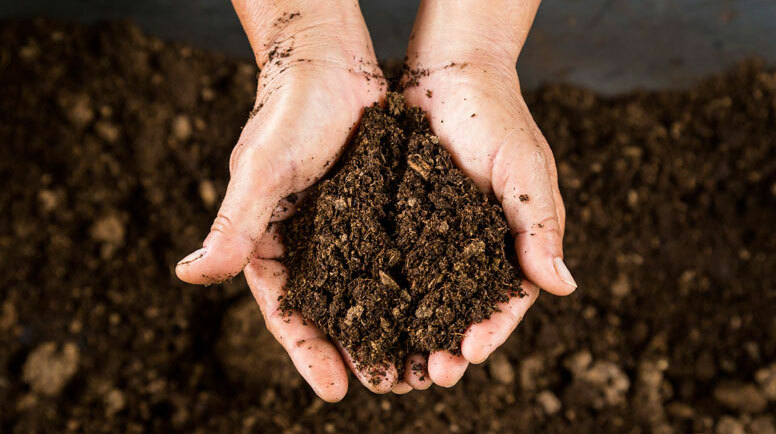 One area in the article we would like to point out is the part about soil that is alkaline. The soil in Colorado, Utah and other western states is in fact alkaline therefore an acidifying fertilizer or sulfur should be applied as they mention. Revive Granules contain 3% Sulfur and three applications per season will fulfill the Sulfur requirements for most yards.